Angelo Lavranos has a huge portfolio of designs to his credit, covering many different concepts. It is always interesting to look at his designs, because they conform to no particular dogma and are all based on very good thinking and experience. Including mini-racers, super-maxis, medium cruisers, cats, houseboats and powerboats - he has done them all . . . 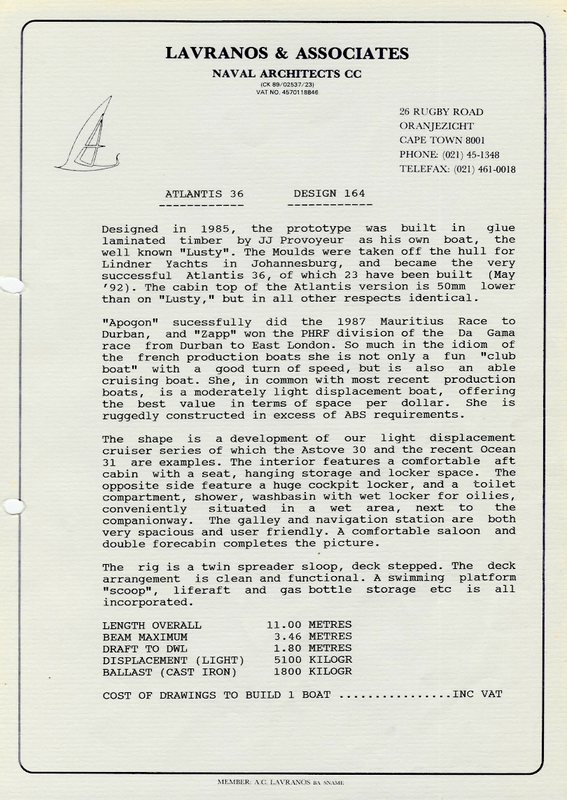 I have had a few requests to cover the L36, the Atlantis 36 and the Tosca 36. It makes a lot of sense to look at them together - they are three quite different but equally good forms of a medium sized performance cruiser. 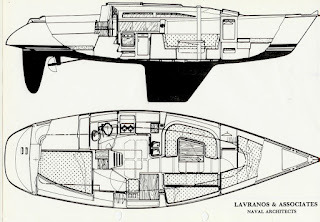 The L36 - is the first design of the three - around 1977/8 - and maybe the most successful. This is also possibly the purest design in that she was designed straight from Angelo's pen - no untoward influence during the design process. Angelo owned one personally for about 16 years viz. "Phoebe" now of FBYC. The L36 is a medium/heavy displacement hull, carries a poweful rig, is a strong all-rounder and held some interesting race records - Cruising division in Cape to Uruguay, and Durban - Cape Town under sail. 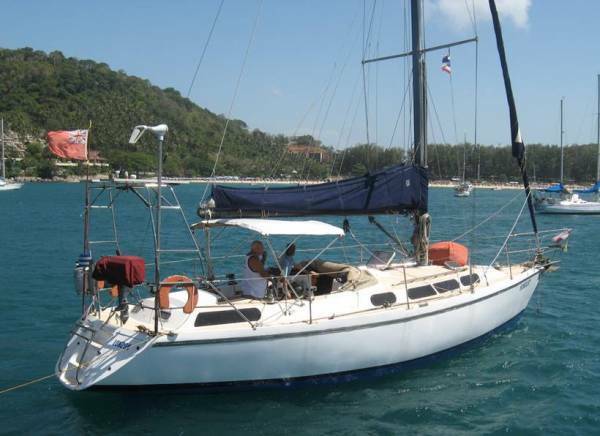 Designed in the late 70s, she was designed as a "little sister" to the Compass 47, with known properties and dynamics. 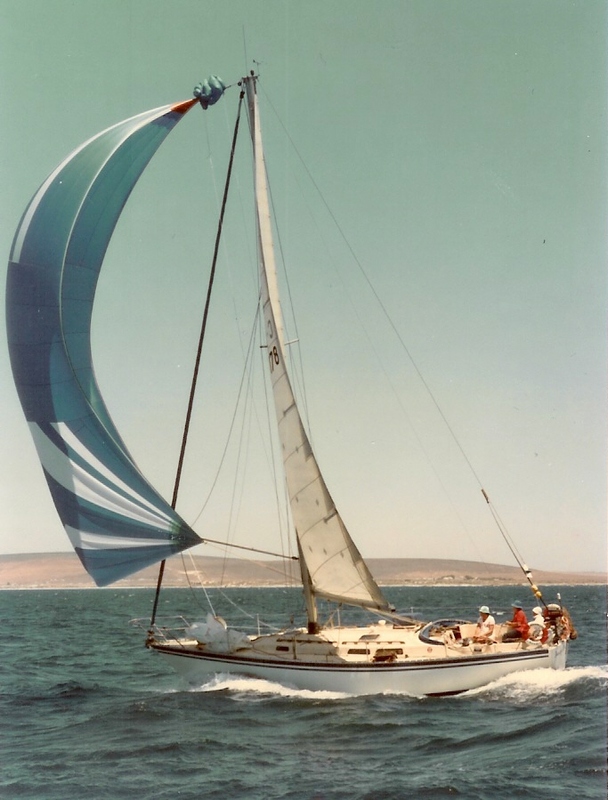 She carries a masthead rig, not so common today, but which I personally prefer to the modern trend of dominant mainsails - especially for cruising. I am not quite sure why the dominant mainsail thing happened - was it IoR or similar, or the attratction of bendy masts, or the S&S doctrine that favoured fractional rigs? Hopefully I can get a designer to explain this soonish. L36 flying along in Table Bay. The L36 is quite a perfomance boat, and a great all rounder as a performance cruiser on all points of sail, though I expect her strongest point will be upwind, where her powerful keel and relatively low wetted area will work well. The hull is moderate - not sportsboat, and not heavy long-keel cruiser. The ends are reasonably fine, making a good sea-boat as well, but not exactly a "downwind racer". The longish keel and deep skeg-hung rudder right on the stern, combined with a fairly slender hull, will give her good balance of responsiveness and ability to track and go straight, whilst not having excessive draught. I can't see this design having any vices, and by reputation they do not. Certainly this has been a very successful all rounder, great for cruising and racing. Despite her proven performance, there are no obvious compromises as a cruiser - certainly she would be on my list as a very good blue-water liveabord cruiser for a couple. Today we can easily describe this design as a very good conventional performance-cruiser. However one must remember this was quite amazing in the late-70s - pure eye-candy I am sure - and is a credit that so many boats still look exactly like this. . . . At least 50 were built, all in GRP as far as I know. Moderate longish keel, skeg-hung semi-balanced (spade) rudder. Prop washes straight over the rudder. Moderate beam and reasonably fine ends. 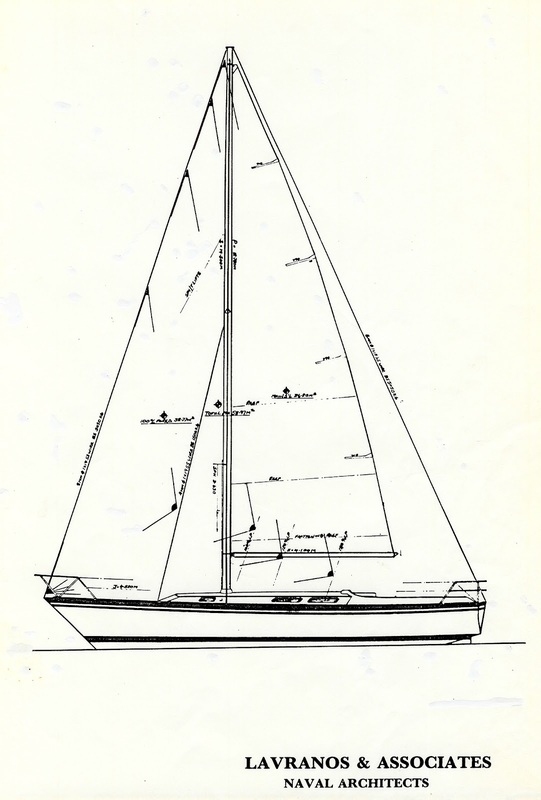 Note the fuel-tank in the keel. Masthead Bermudan rig makes it very simple. The genoa is very large and dominant but makes for a very stable outfit under way. Single backstay. Deck has nice flat surfaces to move over. The Atlantis is a light displacement sporty boat, similar to the French production boats that have become so popular. Great for club racing, with good looks and accommodations, and the now very popular sugar-scoop stern. They seem to have been well-built, I remember being very impressed with the finish and quality of an example we had in Hout Bay a few years ago. It had just come back from the Caribbean with her "novice" crew! While not "out and out" blue-water boats in comparison with say the L36, I would venture to say they are better sea-boats than most of the French production boats around - you can see from the drawings Angelo doesn't do floating caravans unless they are labelled clearly as "Houseboats"!! 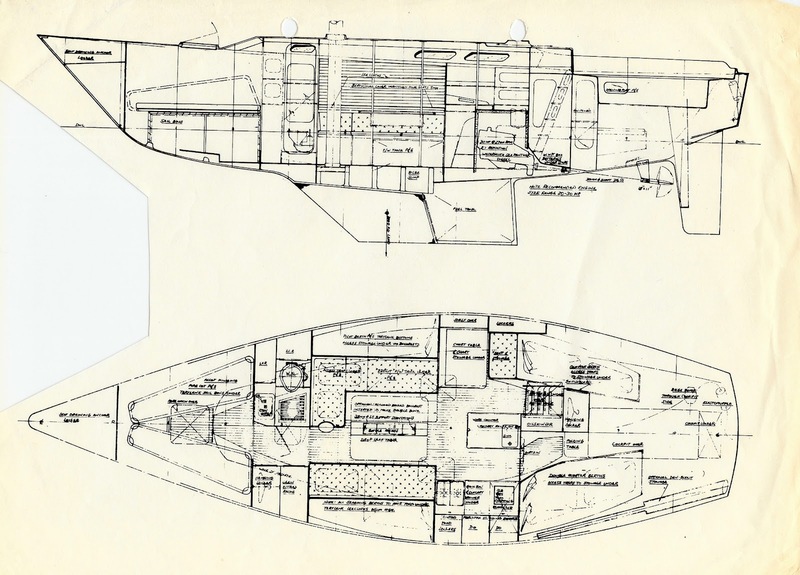 Compared with the L36: Slightly flatter underbody, spade rudder, slightly higher aspect keel, sugar-scoop. 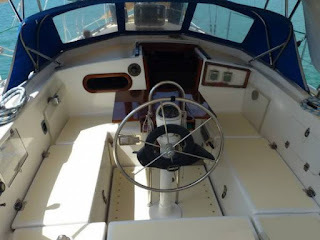 The stern is far narrower than the latest Mediterranean creations, probably losing a third double berth in the proces, something they seem to be hell-bent on getting into even 30-footers today! There is little doubt this concept of boat has become the most popular over time - especially as club racers, coastal cruisers and charter boats. Designed in 1985, it is still a very contemporary looking design. For some reason this is my personal favourite of the 3 - and one of my favourite boats ever. Sometimes you just know it when you see it. . . where have you seen a nicer centre cockpit on a boat this size? or any size? 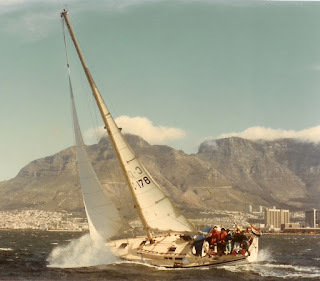 We used to have a great Tosca 36 in Hout Bay called Jandy. Her two successive owners were extremely happy with her, and the second one was able to attest to her seaworthiness through an amazing adventure I don't have space for here unfortunately. I should have bought this boat myself . . . not sure where she is now. 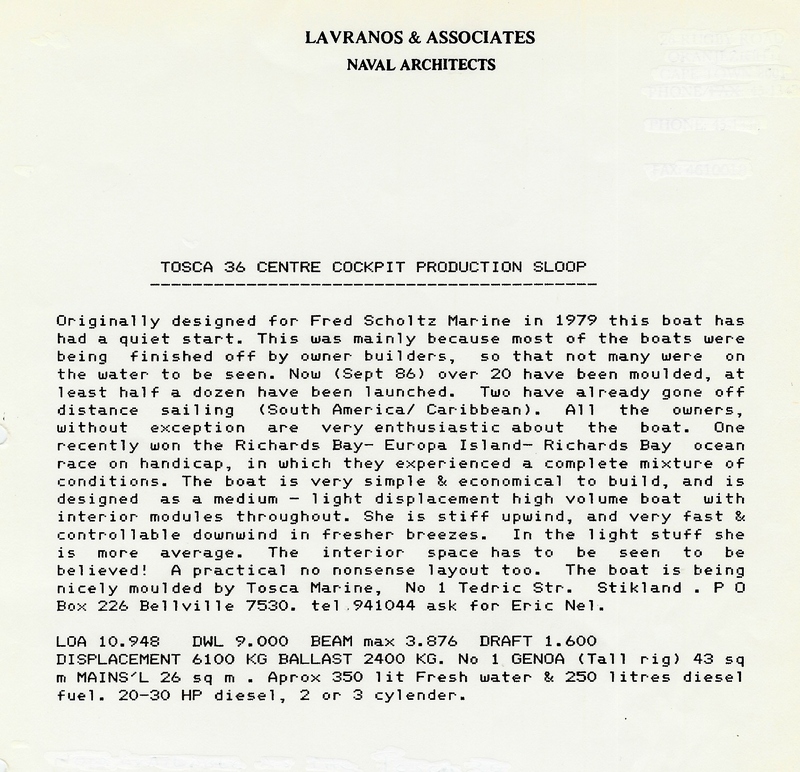 Quoting from Angelo's email to me on the Tosca "Seeing the sucess of the L36, Fred Scholtz asked me to design the Tosca 36, (design 0103) as a production boat, to be cheaper to put together than the L36. Center cockpit rather than aft cockpit. She has a higher volume than the L36, with her beamier, firm bilged, full sterned hull, less ballest, smaller rig, less displacement. Less of an "all rounder" in performance than the L36. More wetted surface and slower in light airs, but faster reaching in a breeze. The original boats were simple & light. Two circumnavigated. Unfortunately as time went on the boats got more elaborate, aft cabin walkthrough, bigger engine, more tankage, bigger rig, stern platform etc." 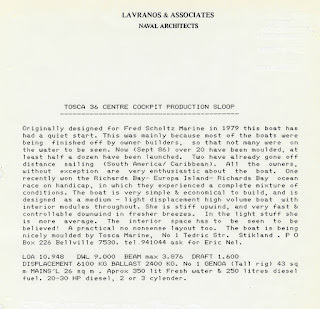 When first sighting a Tosca, the main features appear to be the full beam, large and protected centre cockpit, simple Bermudan masthead rig. Typically the decks are clean and uncluttered. Typically they move a lot faster than you would expect of a boat this beamy. The decks are open and give great space to move on. She really is an inviting platform, with nice curves and overall appearance. I have seen some very nice dodgers and doghouses built for them too, but the level of finishing varies enormously as many were owner-fitted, rather horribly in some cases. . . . Inside, the space is unbelievably voluminous, despite the centre cockpit. 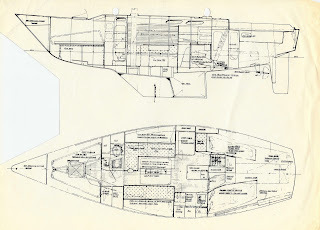 The for'ard section of the hull is large enough so you fortget there is another cabin aft. She has loads of packing space, and the size gives a great feeling of security. Layout is conventional - except the saloon is so wide you have space for an extra pilot bunk above the settees if you wish. The aft cabin is a very nice feature - not an afterthought tacked on in place of the lazarette. It is comfortable and spacious as a cabin, though owners use them for all manner of things - storage, workshops, granny flats etc. Per the original design they are accessible only via the cockpit - but many have been modified for internal access too - not practical in my opinion though. The one I knew had this feature - the owner called it "lumbago alley" . . .
By far the most amazing feature of the Tosca is the generous centre cockpit. It is deep and secure. The shape is exactly right - the mouldings fit your back. It is high and dry above the water. It justifies a good dodger (or doghouse) beautifully, and makes life very very pleasant for the duty watch or the drinking parties equally . . . its enough to justify the whole boat. Jandy - in Hout Bay - was always the boat people congregated on for drinks or tea when the wind blew. I really wish there were more boats with this feature. The Saloon was also great - not unusually great, but quite adequate - which means there is always a "nice place to be" on the boat - although the V-berth was a bit small on the example I know - but hey - the aft cabin was great . . .
Dynamically - Toscas sail well. They held some good passage times on the Governors cup - Cape Town to St Helena - a nice long downwind reach - and are clearly able to survive fierce weather. I did see one being laid over in a sudden squall under full rig in Hout Bay's "Thunder Alley" one day - spreaders in the water - she popped right back up without changing direction and kept going . . . Being light and beamy, and roundish, they are good trade-wind cruisers, and very comfortable. I reckon they'll manage upwind quite well except in gale-force conditions. Reaching would be the preferred point of sail, and they actually do quite well round the cans in moderate conditions. The rig is delightfully simple - a single spreader affair, with masthead Genoa and manageable Main. Cheap and easy - and great for cruising. Often one could use the Genoa alone. Roy McBride - of CKD Boats - has fitted several of these and reckons they represent one of the best value cruising options anywhere. I agree. I wonder if musicians can appreciate written music before they have heard it played? I guess they probably can otherwise how would they write it? 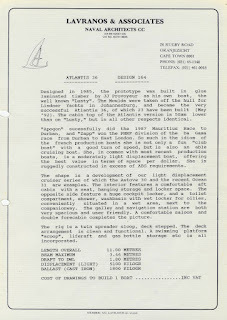 Anyway - this is the first boat review I am prompted to do on a boat that has not actually been built yet. Its also the first one for which I have been prompted to include an exclamation mark in the name! You'll see what I mean . . . there will be more to come when we see it on the water. This is an extraordinarily interesting design from a number of perspectives. When I first saw the outlines on Roy McBride's blog I responded with a short email commenting on the design which he immediately published, and the interest in this design has been immense. Click on the pic above for an animated 3-D view on YouTube. 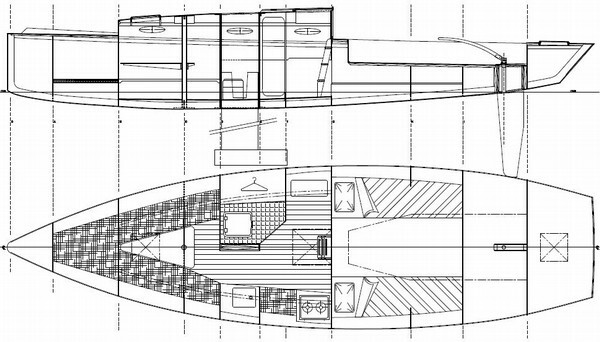 Note the planing underbody, powerful, high-lift keel, and the deep high-aspect rudder. Only the plum bow and the transom-sheer can be seen above water! 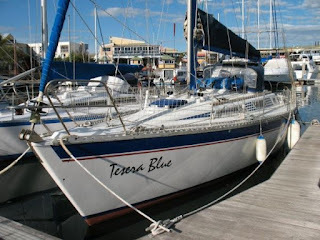 Classic topsides including the transom sheer, vertical cabin sides, classic bowsprit, and slightly raised bulwarks up front. Her moderately slender profile gives no further clues to the sportsboat lurking in her! For all the world she looks like a classy and humble old gaffer. Originally gaff rigs had loads of sail (and sails) spread fore and aft on the hull as early technology couldn't support tall masts and high point-loads, or deep keels for that matter. So this rig is capable of hiding a vast sail wardrobe "at the ready" in a low-tech guise. Never mind the powerful assymmetrical on the 2 m bowsprit. 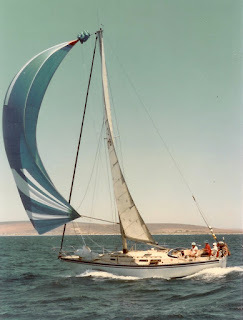 Never mind the full roach gaff main, or the two headsails which can be used seperately or in combination, and sheeted right into the centre if desired . 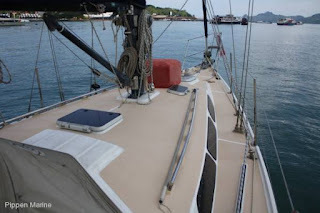 . .
Space below is limited but practical and well used, with decent heads and galley. Headroom is limited at 4:3" - about the same as an RCOD or my Flamenca - but enought to get about in. Enough crew-berths for an offshore race, or family weekending at a pinch. Compared with say a Pacer-27 she is cavernous! When I first saw this hull it struck me of the old days when people placed V8s in a "stock standard" looking VW Beetle, and proceeded to blow the socks off the Ferrari's of the day! While that is an unfortunately crude analogy, the element of suprise compares very well! 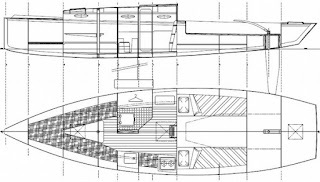 As you can see, the underbody of this yacht is pure sportsboat (without excessive beam and fat stern) - the flat planing sections at the back, long waterline, high aspect (bulb) keel and rudder, deceptively firm bilges, and quite easily-driven (slender) at that. Built from the well proven DiDi-26, the dynamics are well understood, with the advantage of quite a bit more length. Construction from ply will keep it suitably light and very agile. The topsides have all the styling cues of a proper old gaffer. Hahaha! This is where the fun really starts. Gaff-rigs, even in their old original form, are amazingly capable rigs. The well known sailing author Frank Robb wrote a convincing argument explaining his preferences for Gaff Rigs some years ago. In recent times, modern materials, technologies, and the IRC have made a clear winner of tall Bermudan Rigs with dominant mainsails however. Can this design change the state of play again? Probably not, but its going to be quite an interesting race in this example, especially if IRC is left out of the picture. Firstly, Gaffs are damn fast downwind, and in in all points except hard on the wind. Their centre of effort is much lower than a Bermudan rig, and the roach much fuller. They produce awesome power and penetration, whilst also being more controllable in very heavy winds - as the mast is far shorter - so avoiding the instabilities of tall masts once they are over-powered or start rolling. More broach-resistant by far - which means you can drive quite a bit harder . . . On this 29 Retro, there is the small matter of a big assymetrical on that 2m bowsprit. Given the usual 25+ knots in the Mykonos race, I would be tempted to try it under the spinnaker alone. It will be astonishingly stable using just the bag, which is pulling far ahead of the centre of drag, whilst generating lift on the bow. As such, the rig is inherently stable, it shouldn't be able to broach at all . . . the planing underbody won't produce much argument from the hull, and the combination should be good for > 20 knots in the right hands!! Can't wait to see its first Mykonos race. Even with the main up, the gaff main is far more stable off the wind than its Bermudan counterpart, being far lower. Notice the spars are all carbon-fibre . . . This rig offers a lot of canvass in many combinations. 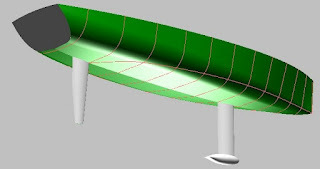 The hull is easily-driven and light. One tends to sail slightly looser in light airs anyway, so the gaff main will cope well. 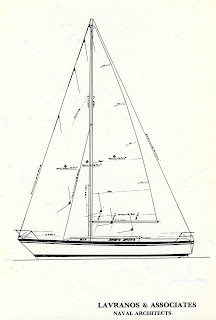 The two headsails could be flown in combination(s). It should be a killer. Upwind in fresh conditions, Round the cans. Established wisdom on gaffs suggest this will be its weakest point of sail, but I really suspect this is where this rig will offer its biggest suprise. Perhaps even the designer will be suprised! Why? Well typically, the fastest boats upwind are smallish, light and beamy, and benefit from generous crew weights on the weather rail. They generate huge power from the relatively high righting moment against the heeling force. L26s come to mind, and suitably crewed Pacer-27s, Melges 24s etc etc. Even Miuras are quite impressive in this role. But don't forget the RCOD. It's a slender hull, heels like hell, lacks power in the rig, but makes good angles and is easily driven. It moves nicely through a sharp chop on the water. Somehow they get to the next mark faster than you expect. This 29 Retro will do all that and more. The hull will track and point beautifully. 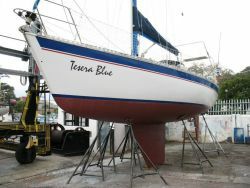 The high-aspect (bulb) keel is good for plenty of lift, and its depth will provide good power at a fair angle of heel. 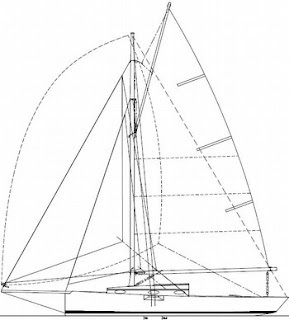 The headsails can be sheeted extremely close as they don't clash with the stays. This gaff main is a very neat example - I don't see why it won't come in as close as a Bermudan main given the way the top-spar is fixed? The lower centre of effort is an obvious advantage. As a helmsman, in fresh conditions, I would optimise the headsail(s), use the main primarily to balance the helm upwind, and see how she goes. In lighter conditions she will reward a looser angle of sail favouring hull speed and this may be the way to get a good VMG. Some time with a GPS will be useful. One way or another, there is a lot more to this rig upwind than meets the eye. All in all - this is going to be a very interesting boat to sail and own. There are many races she will do extremely well in, and will suprise the fleet in all circumstances. The beautiful looking traditional element is a joy to any yachtsman. She will dominate the bartalk, the press and the photo galleries. Having driven camera boats at various regattas I can just imagine Trevor Wilkins and Brenton Geach chasing after this baby, with or without the sponsors logos! I wouldn't want to be on the club handicap committee after the first race . . .
To add some further interest, I don't think this boat will need much in the way of winches - and the standing rigging will be very clean and simple. There is no need to get on the foredeck, and she will be easily handled by two people, making the element of suprise even greater! This going to cause a lot of head scratching with sailors and designers alike . . .
Part 2 will come when we have seen her on the water - in 2013 I guess. 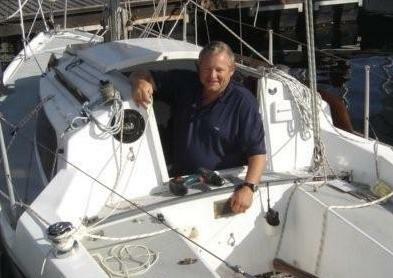 See Roy's blog at ckdboats.blogspot.com for details on the build as it happens, and the kits.